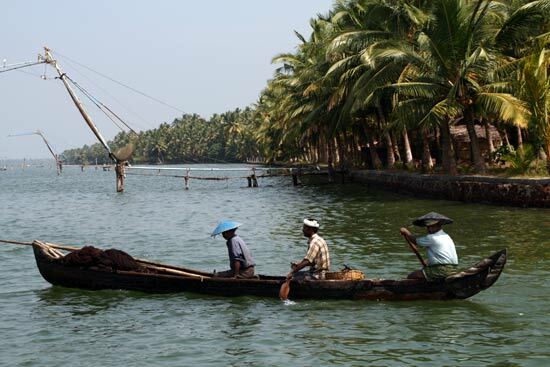 Travelling the Keralan backwaters by canoe is a fantastic way to explore. It’s cheap, easy to arrange, and you can see the village life and wildlife of the backwaters up close. We featured a canoe trip as one of our favourite ways to experience the backwaters in the last Kerala India Travel blog post. Here’s some more information on our backwaters canoe adventure. We arranged our first canoe trip from Kollam (Quilon), a typical small market town in southern Kerala. We were here to arrange our houseboat trip to Alleppey, but while we were waiting we decided to visit Munroe Island by canoe. The trip was easily arranged at the DTPC tourist information centre by the jetty and bus station next to Ashtamudi Lake. The half day tour costs 300 rupees per person (US$6), and is well worth it. Children under 12 even ride for free. The day began with an hour’s rickshaw journey by road (included in the price) through the rural landscapes on the outskirts of Kollam, to a backwaters village where we met our boat. The traditional wooden canoe could seat up to 20 people but luckily we had it to ourselves, along with a boatman and our guide Suji. We began meandering slowly through the network of tiny canals and rivers, our canoe gently propelled by punting with a long bamboo pole. It was very peaceful and relaxing, amongst the green coconut palms, blue kingfishers and still waters. One of the most interesting parts of the canoe trip is getting to see village life up close and learn more about life here. We saw how people make a living by numerous means: collecting sand by hand from the river bottom to be used for making cement; fishing from canoes; prawn farming; and keeping cows and goats. We got so close that a goat even jumped into our boat at one point! It was fascinating to see aspects of village life that have remained unchanged for centuries. Boats (including the canoe we travelled in) are made using sustainable and local materials – wood from a jack fruit tree, woven together with coir (a coarse fibre found on the outside of a coconut shell) and sealed with fish oil. The boats last for up to 65 years, with a yearly application of fish oil. We took a break from the canoe at one point, to explore the village on foot. Here we saw (and tasted) the locally grown spices – vanilla, tumeric, ginger, cloves, nutmeg, cinnamon and pepper, grown in gardens alongside pineapples, bananas and more. It was a fascinating experience, and far less commercial than a visit to a spice farm. A canoe trip through the backwaters is definitely recommended as an affordable and fascinating way to explore this wonderful part of Kerala. In later Kerala India Travel blog posts we’ll be telling you all about our houseboat trip, and another magical canoe trip at our backwaters homestay. Sign up to our RSS Feed so that you don’t miss out. This entry was posted on Tuesday, August 18th, 2009 at 1:36 pm	and is filed under Kerala Backwaters, Kerala India Travel. You can follow any responses to this entry through the RSS 2.0 feed. Both comments and pings are currently closed. The canoe trips leave at 9am and 2pm. What was your hotel problem? I don’t have any particular recommendations for Kollam. We stayed at a cheap hotel that we found on arrival. Love the blog, thanks for the good advice. Its often a struggle to find good ideas amongst the huge amount of tourist websites that are more confusing than informative.